Why has Ensotech decided to manufacture sensored motors themselves? Simply because Ensotech do not recommend to use a non-equivalent mechanical timing motor which the motor rotates in un-equal speed also to create an un-equal induced voltage to damage ESC !! Ensotech being a ‘perfectionist’ company having a perfect ESC wasn’t enough and is now proposing a perfect Swave ESC and well-developed motors. Why limit your ESC’s performance and VOLID THE WARRANTY by using a non-certified motor with the Ensotech Swave ESC, when you can have the best of the best proposed by Ensotech, THE innovator or the best sensored technology themselves. In more technical terms the art of configuring the mechanical timing of a sensored motor as well as the winding method is so precise that Ensotech only has confidence in themselves to do the job done right, and has decided to oversee the process in house from start to finish. This ensures the production process of the Swave-ZM sensored motors is consistent, and provides a perfectly matched motor technology for Swave ESC owners. This is very important because our motor design is different (low profile) compared to others. 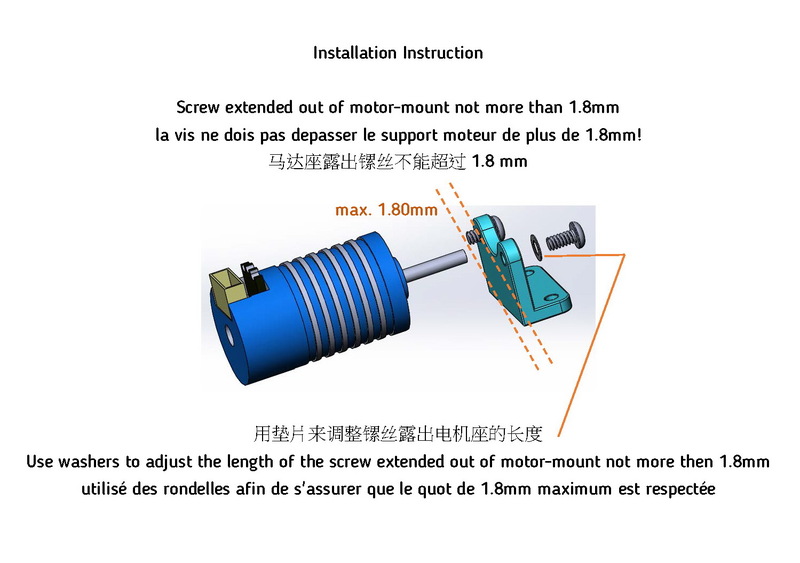 Our motor does not allow the motor screws to be too long otherwise it will go too deep towardto the motor core and damage the motor winding. If the screw touches the motor winding and customer try to connect the ESC, both motor and ESC could burn immediately! Ceci est très important car la conception de notre moteur est différente (profil bas) par rapport aux autres. Notre moteur ne permet pas que les vis du moteur soient trop longues, sinon il irait trop profondément vers le noyau du moteur et endommagerait l’enroulement du moteur. Si la vis touche l’enroulement du moteur et que le client tente de connecter le contrôleur, le moteur et le contrôleur risquent de brûler immédiatement!